I love that there are gi companies out there trying to be innovative. I first heard of making gis out of hemp about two years ago. Unfortunately, that company never took off, so I was never able to buy one. Bummer! 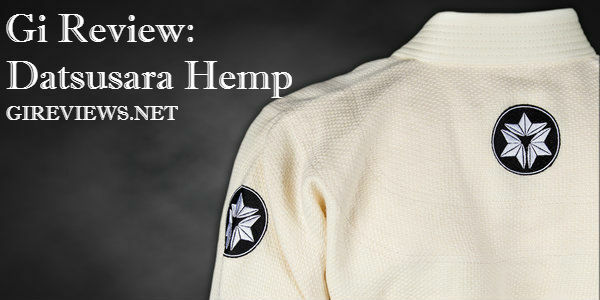 But then I heard about Chris Odell’s company Datsusara MMA which markets gear, gis, bags, and clothing made of hemp. Hemp fibers are longer, up to four times stronger, more absorbent and more mildew-resistant than cotton. It’s environmentally friendlier to grow than cotton, requiring no pesticides and producing more fiber per land area. 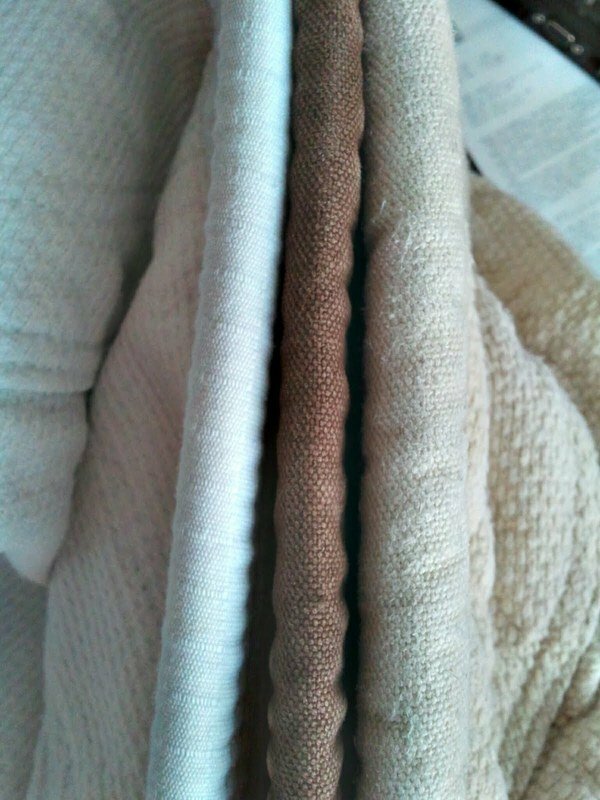 Hemp fabric is also naturally antibacterial and antimicrobial– so I was very excited to give it a try. Chris generously sent me one of their Hemp Combat Gis for this review and I have been wearing the HECK out of this thing ever since. I received the gi at the end of February. 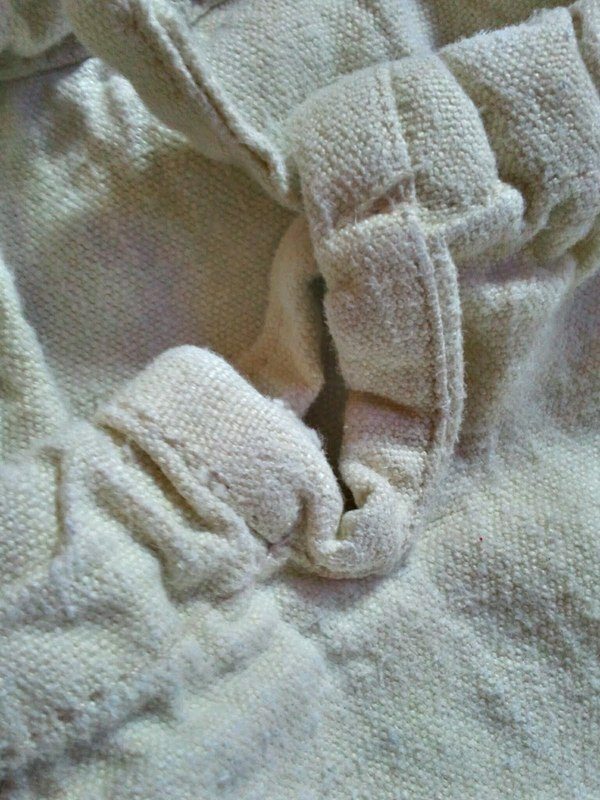 Right off the bat, I noticed they include two pants drawstrings– one of fabric, one of cord, like a thin rope but smoothly-woven or twisted. I left the fabric one in the drawstring pocket and it seems like it might be tough to switch out, as the drawstring pocket is narrow, so I might have to unknot the ends of the cord and use a wire coat hanger to make the switch. However, the fabric drawstring hasn’t given me any problems. There are only two loops for the drawstring on the front of the pants, which is not my preference. Here’s the only labeling or “bling” of any kind on the pants– a label sewn on the front of the left hip. Since then I haven’t measured each time, but I have not noticed any additional shrinkage. The gi fits very well– it’s competition legal, but not excessively flappy anywhere. I do not believe this to be a “judo” cut, which was a comment from the early test versions (2009-2010) of this gi. The drawstring itself is definitely on the short side, but I don’t like to tie mine in bows, which is good as this is clearly too short for bows. I tie a square knot which doesn’t come undone and is easy to untie when wet. Also, a nice touch: the front half of the pants is lower than the back! Therefore, more room for junk in the trunk, without the front waistband coming up to your ribcage. I was very impressed with the fabric itself; a little less impressed with the construction. Everything is double seamed or triple seamed. 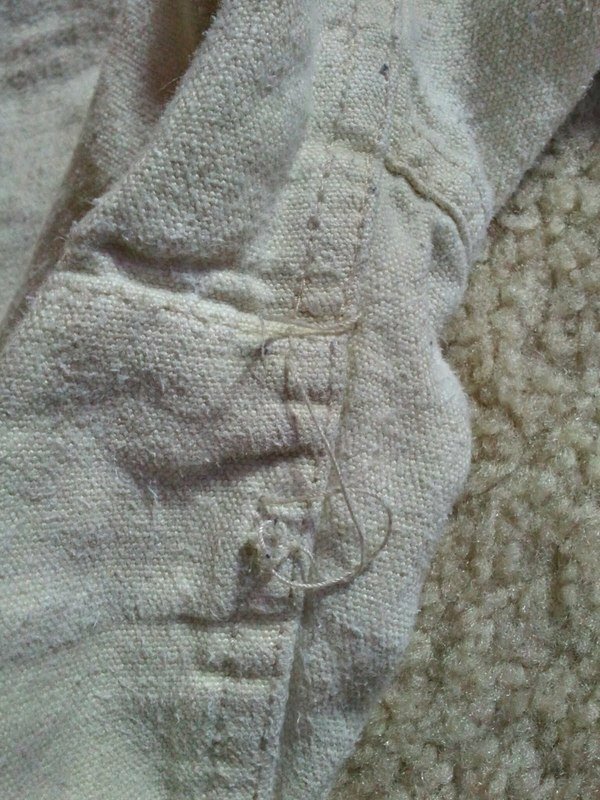 Second, I only noticed one “error” in the construction– on one of the seams on the inner thigh, I found a loose thread. It’s a length of seam about 1″ long and the thread just wasn’t caught properly by the bobbin thread, so it’s a loose loop as opposed to a cut thread hanging out. It’s the center seam of two lines of stitching, so it doesn’t affect the durability or integrity of the seam itself, but it does invite you to stick your finger in it and attempt to break it because you’re too lazy to get a pair of scissors. I think the thread must be hemp as well, because that sucker is STRONG! I have tried and tried to break it (even used my car key once) and it refused. So I leave it alone now. I did notice a few other loose threads in the interior of the gi, but haven’t had issues with splitting, tearing, or durability in general. And I have worn the cr*p out of this thing in an attempt to really put it through the wringer. The cuff is triple-stitched and French hemmed. The interior of the armpit and the front breast seaming is thoroughly reinforced. There is no seam on the back of the jacket. The collars are soft but quite thick. I don’t feel a rubber/foam core like many gis, and so it is a little easier to grab than a new Atama, but not much easier than a worn-in Gameness, and it fills up your hand a little faster because of the thickness. The benefit of the fluid fabric and soft collar is immediately apparent if you play a wrapping game. For thickness comparison, from left to right– the Atama Mundial #9, a Koral (not the MKM or the Lightweight one, just ordinary Koral), and then the Datsusara on the right. Fifth, I tried to make the gi stink, to test this antimicrobial thing. I had three legendarily stinky tshirts (the ones where you wore them grappling with a stinky guy, then let sit in your trunk during the hot day, and forgot to wash promptly when you got home, and so even when washed, they have a stink?) So I wore one to class, got it all wet and sweaty, with this gi. Put the gi and tshirt in the trunk and parked on the roof of the parking garage so it was in the hot sun all day. Took it home and left it balled up on the laundry floor for 24 hours. (It was still wet and even WARM in the middle the next night.) Washed it in ordinary laundry soap and voila– the tshirt smelled still, but the gi was fine! I know, not very scientific, but it’s the best I could do without a microscope. (hint hint Seymour….) So I pitched the stinky tshirts, and kept the gi in the rotation. Over time, I have noticed that the color is a little less “warm” in tone and has become a tad greyer. I wouldn’t say this is a “white” that would be IBJJF-legal, either when brand new or when well-worn like mine. Amazon has the best and latest collection in BJJ gis — SHOP NOW! It retails for $140 and I think it is worth it. However, some say the price will go up! Head over to Datsusara Hemp Gear for more details. Oh noes! I don’t know how I cut it off. I’m changing around how things are organized on here. I’ll make sure that I add it back in shortly. Thanks again Slideyfoot! So i needed again a new gi, because I’ve added some Trainings Session in my schedule. Also i needed a good Backpack. After i heard alot of good stuff about the Datsusara Backpack i ordered one, also Chris (in additional to the great products, GREAT Customer Service) let me know that my untrained body would fit in the 175 cm Hemp Gi. I would say, this Gi is tailored for me. Its snug and roomy at once. Great weave, very light and looks durable too me. I have a lot experience and would probably say, this is one of my Top Gi’s every. Especially the “i feel comfortable factor” is great. It is also one of my main reasons to give the kimono a 9 / 10. Just one point is missing: different colors. BUT i add a point for the great unbleached color. I am very happy to order that gi, its great! This gi looks like crap lol there are far better options out there… just saying. have you seen or felt it in person Reggie? I loved the Review, you convinced me to contact them to see if they have my size. For the money I think it will be best deal in long run. I got this gi, I like it but it’s failing apart at the seams. I tried to get it fixed with no luck other than having to buy a new gi.